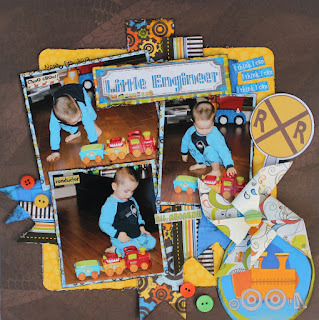 I love this Bo Bunny line for little guys and it was so great that it had lots of train embellishments to use! Perfect for the photos I wanted to use! Noah just loves this little musical train. It is an old one. I had it for the girls when they were small and kept it around. Those Fisher Price toys just never seem to wear out. This is just sooooo cute!!! Love it! Such fun embellies on this Char. It's just so cute! Oh I love it.. I have this paper collection and you inspire me to create great things with it :) Love the pinwheel, by the way..
All the musical toys are always the best! you pick by pushing the button...no idea where it came from? Maybe my niece? Ok, well as always I ADORE your creations and LOVE the goodies you've added! love the bright colors...this is just gorgeous!! Such a cute lil' guy layout!! Love the little pinwheel!!! Hugs!! Adorable Boy layout! Can't get any cuter than that, Charlotte! I think boys and trains are a natural fit! This is gorgeous Charlotte..you have scrapped those photos perfectly!